Our keynote, Dr. Kim Eagle, will present: “Cardiac Risk of Non-Cardiac Surgery-A Piece of my Mind”. Dr. Eagle is the Albion Walter Hewlett Professor of Internal Medicine, Professor of Health Management and Policy at the University of Michigan School of Public Health, and Director of the Frankel Cardiovascular Center at the University of Michigan. He attended Oregon State University, followed by Tufts University Medical School. He completed a residency and chief residency in Internal Medicine at Yale-New Haven Hospital followed by research and clinical fellowships in cardiology and health services research at Harvard Medical School and The Massachusetts General Hospital. Dr. Eagle served MGH where he was promoted to Associate Director of Clinical Cardiology and Associate Professor of Medicine at Harvard before moving to the University of Michigan. 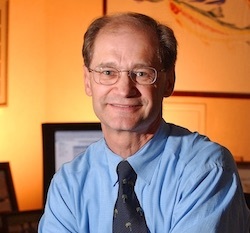 At the University of Michigan, beginning in 1994, Dr. Eagle developed an outcomes research program focusing on quality, cost-effectiveness, practice guidelines, acute coronary syndromes, treatment of aortic diseases, the fight against childhood obesity (Founder -“Project Healthy Schools”), and heart disease in special populations.